Snackshot is a new HK style dessert shop in the Marpole area. I still remember when this location was Bubble World back when I was in high school! It’s located next to Qoo Cafe on Granville and 64th. The outside doesn’t look that inviting but the decor inside is on point. I don’t normally gravitate towards Asian desserts (I’m more into cakes and pastries) but I was interested in trying their dessert platter and the Vitasoy Bulldog drink. Also, it took me 20+ years before I could accept red bean as a dessert. This entry was posted in Desserts and tagged black sesame paste, red bean soup, sago, tofu pudding. After eating dinner at Shanghai House, my friends and I still had room for dessert so we walked to the relatively new Mango Yummy across from Richmond Centre. Once we opened the doors, we were hit with the smell of durian and although I’ve actually never tried durian, I don’t find the smell atrocious but just an FYI they do serve durian pancake/crepes here! The store is tiny as usual and since we had a group of seven, we ended up waiting for 35 mins for a table. At the same time, we couldn’t come up with a better dessert plan so we ended up waiting. We finally managed to get a table meant for three and squished seven people around it. They have an impressive array of drinks, smoothies, tofu desserts, shaved ice, sweet soup, toast and some waffles, cakes and crepes. I remember visiting their stall at the night market for at least two years. This was the Mango and Mochi with Vanilla Ice Cream Shaved Ice. This was served on a plastic dish and there was an impressive amount of toppings. The mango was pretty sweet and the mochi had a very satisfying chew to it. The shaved ice is not flavoured though like at Frappe Bliss. It’s just ice but shaved very finely and I really liked the texture here. 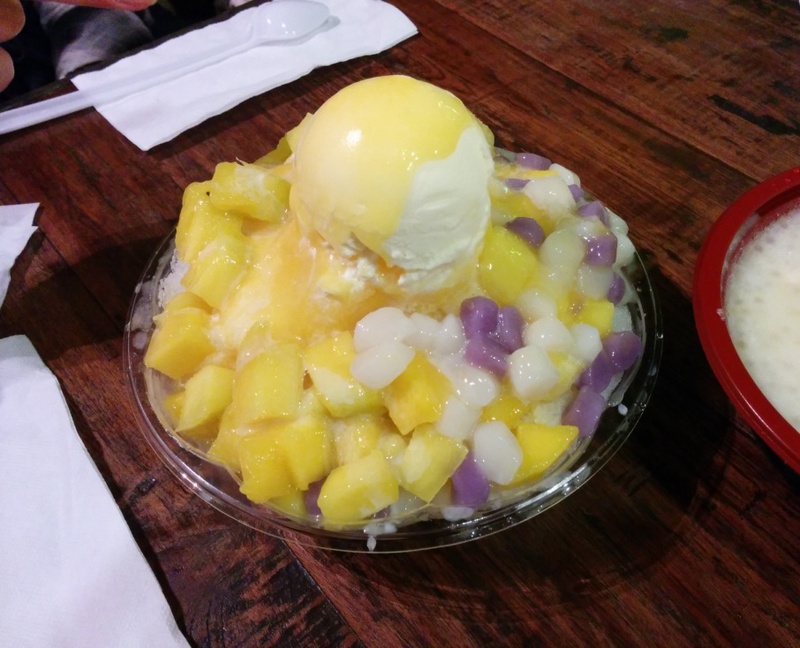 This entry was posted in Desserts, Food Reviews and tagged green tea ice cream, ice cream, mango, mochi, red bean, sago, shaved ice, sweet soup.